You can add meat to this dish, but the lentils are sufficient as a meat replacer. They are high in protein, fibre and iron and a range of different vitamins and minerals. Low in cholesterol and low in calories, lentils are a indeed a very healthy replacement for meat. Cook the red lentils in 400ml of the bouillon for around 20 – 30 minutes until soft. Boil the potatoes for about 20 minutes in water. Heat the olive oil and fry the onions and garlic for 2 minutes, don’t let the garlic burn or it will go bitter. Add the sauerkraut and the rest of the bouillon and stew for 10 minutes at a low heat. Drain the potatoes but keep a little of the water. Mash the potatoes with the cooked lentils.Season to taste with salt and pepper. 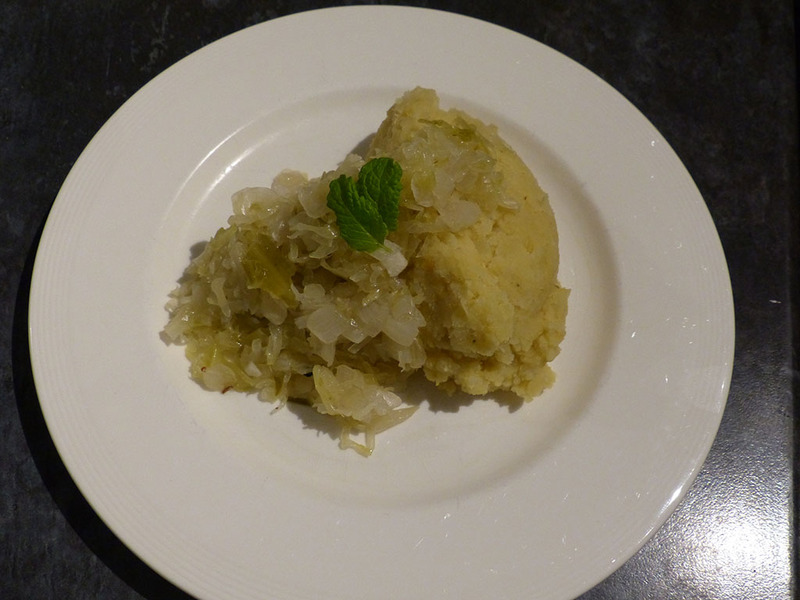 Put the potato/lentil mix on a plate and serve with the sauerkraut/onion mix.